PORT-AU-PRINCE—A brewing rebellion from ex-members of Haiti's disbanded army is adding uncertainty to the poor country one year after President Michel Martelly began his term with a pledge of renewal in the wake of a devastating 2010 earthquake. For three months, the troops have occupied their former barracks in at least five cities, set up a general headquarters just outside the capital here and trained hundreds of new recruits. In some cases, the ex-military men have patrolled the capital's streets, dressed in makeshift green camouflage uniforms. Members of the dissolved Haitian army and civilian volunteers paraded at the former military base Camp Lamantin, in Port-au-Prince last month. The leaders, noncommissioned officers in Haiti's former army before it was disbanded in 1995, at first demanded 18 years of back pay. But now they are also insisting on being a part of a proposed Haitian army. "If anyone tries to dislodge us, it will be all out-war," said Noel Edmond, a 48-year-old former sergeant, as he peers down at the capital from a camp perched on a mountain peak. Mr. Edmond said he has been training with his recruits for six months. The issue is shaping up as a yet another challenge for Mr. Martelly, a former pop star turned politician who was inaugurated on May 14, 2011, in the aftermath of the quake that killed hundreds of thousands and devastated this capital city. Last month, Mr. Martelly's government said it would compensate the ex-officers. But it is unclear if that will satiate them. Mr. Martelly has so far struggled in power. He has had a functioning government for only four months, partly due to a combative Parliament that has blocked his choices for prime minister. The power vacuum has derailed crucial municipal elections and constitutional reforms meant to foster foreign investment. Mr. Martelly may have inadvertently sown the seeds for the current troubles during his campaign, when he openly called for a new modern army to replace United Nations peacekeeping forces in Haiti. His proposal is strongly opposed by the U.N. and the international community in Haiti, which prefer him to focus on strengthening the police force and democratic institutions. Haiti's army dominated this country's politics for two centuries before it was disbanded in 1995 by former President Jean-Bertrand Aristide after he was ousted by a violent military coup in 1991 only to return to power in 1994 when U.S. forces helped dislodge Haiti's military rulers. Mr. Aristide kept 1,500 members of the 7,500-strong army to serve in a newly created Haitian police force under Swiss advisers' supervision. Most of the other troops fled to neighboring Dominican Republic or quietly melted into Haiti's vast population. But the former military men have resurfaced every few years, usually asking for back pay and trying to revive their long-dormant military careers. In December, the Martelly government unveiled a plan to re-create an army at a cost of about $30 million a year, or 1% of Haiti's annual budget, to help protect borders, assist in natural disasters and patrol its waters and airspace. "We have an army, we have the money and we have the arms," he said on Haitian radio. That emboldened the former military men to come down from remote mountain camps and take over their former barracks. During March, the government twice gave them deadlines to leave. Twice the deadline passed. Finally, the justice minister ordered Haiti's National Police to forcibly remove them. About 100 armed soldiers responded by descending on Parliament, causing panic. National Haitian police and U.N. troops surrounded the premises until the group left, without incident. So far, Police Chief Mario Andresol, himself a former ex-army captain, has balked, saying he doesn't want to provoke bloodshed by confronting what the U.N. estimates are about 2,500 lightly armed troops. "I'm up against the wall with the order to go after these ex-army guys it would be suicidal," he said in a recent interview. Mr. Andresol said the problem was not the former troops as much as the young recruits. "It's a bunch of old guys that have surrounded themselves with young people. There are maybe 200 noncommissioned officers. They can be paid their back pay and they'll go away, but what do we do with all these new recruits?" As he spoke, several cellphones rang on the couch next to him. Several ex-officers and some new recruits had just taken over the barracks in the town of St. Marc, and the police in the town have asked Mr. Andresol what to do. "I've told my chief there to try to control the situation without confrontation," Mr. Andresol said after the calls. "All it takes is for one incident, one person wounded, and civil war will break out in Haiti." The government has asked the U.N. force in Haiti to back up the police if force is needed. But Mariano Fernandez, head of the peacekeeping forces, said it isn't the mission's mandate unless U.N. personnel or the country's security is seriously threatened. "It is illegal what the [ex-officers] are doing and we see it as a very serious political problem," Mr. Fernandez said. The informal headquarters of the ex-army troops is a rundown former hospital north of the capital. In front is a freshly painted yellow iron gate bearing the bold black letters that read FAD'H, meaning Armed Forces of Haiti. Michel Lophene, who says he heads a nine-member chiefs of staff overseeing the ex-army soldiers, sits at a small school desk in a dark room. Clothes and a towel hang on the only nail in the room. There is no electricity. "Most of us were sergeants in 1995, we were given a two-month leave that turned into 18 years," Mr. Lophene said, adding that he and his men began mobilizing in 2010, when Mr. Martelly began to promise the army's revival. "We support him. He supports us, he's the supreme commander." Standing next to Mr. Lophene is Oelance Belizaire, the 49-year-old base commander. Mr. Belizaire, 49, stood rigidly, wearing an old knife, a beat-up leather bullet strap across his chest, motorcycle knee caps, a bullet-proof vest three sizes too small, and an old Galil rifle. His green eyes peered straight ahead under his old cap. "It's the institution we stand for," he said, saluting and citing his start date and military ID number: "April 1, 1979, matriculation 34594." Outside, about 50 trainees, including two women, marched in formation. Many of the recruits are like 23-year-old Mackenson Paul, a high-school student who said he signed up in the hopes of landing a job in the new army. At a former naval base south of the capital, ex-officers have since set up a new camp. On a recent day there, about 50 young men and women in green uniforms and leather black boots rehearsed marching steps shouted by a lanky older-looking officer. 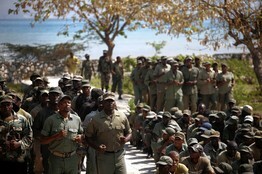 The base commander, 48-year-old Jean Vednel Lafalaise, said as many as 5,000 recruits have been trained at Camp Lamontin. Mr. Lafalaise said that if the government allows them into the new army, "we'll revert to our former ranks and say 'Yes sir.' Otherwise, it's the army or death." A version of this article appeared May 11, 2012, on page A8 in some U.S. editions of The Wall Street Journal, with the headline: In Haiti, Ex-Troops' Bid for New Army Threatens Stability. Copyright 2012 Dow Jones & Company, Inc.
Reprinted from The Wall Street Journal of Friday, May 11, 2012.